Seniors – worth their weight in gold! Half-price for some paid activities such as TECHconnect Computer Classes. For people who find reading an ordinary print book difficult, the Library provides access to other formats such as large print books and audio books on CD. There's a range of titles including a variety of fiction, non-fiction and the Reader's Digest magazine. Search our catalogue for Large Print or Audiobooks by selecting clicking their respective links. The Library has a wide selection of online resources for your leisure and online learning. Explore eBooks, eAudiobooks, online learning resources and more at our eLibrary section. Each of our three libraries provide a wide range of services and materials for senior library patrons. 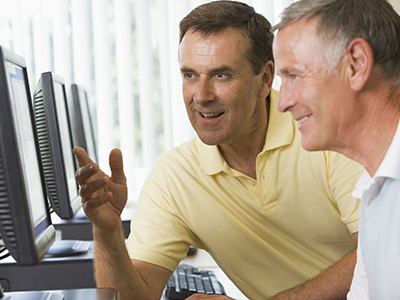 Randwick City Library has a range of seniors' computer classes for beginners and those further along.